Many species of Galapagos’ wildlife and marine life find a productive resource-friendly home on Cape Douglas and thrive on its abundant marine life. This is the home to fur sea lions, Flightless Cormorants and marine iguanas. It is also a location to see an abundance of endemic Galapagos snakes. These snakes were observed and studied by Galapagos naturalist Godfrey Merlen who recently reported his findings about some of the unique feeding habits of the Galapagos Racer snake. Since I was born and have lived in Galapagos all my life, I've seen my fair share of snakes. Admittedly, I don't count them as my favorite reptile in Galapagos. Then, again, I've never been privileged to see the fish-eating kind. When I do, I’ll probably see Galapagos snakes in a whole new light. I know of course that our snakes eat lava lizards, little iguanas, rodents and bugs. But, this fish-eating feature appears to be a fairly recent adaptation. 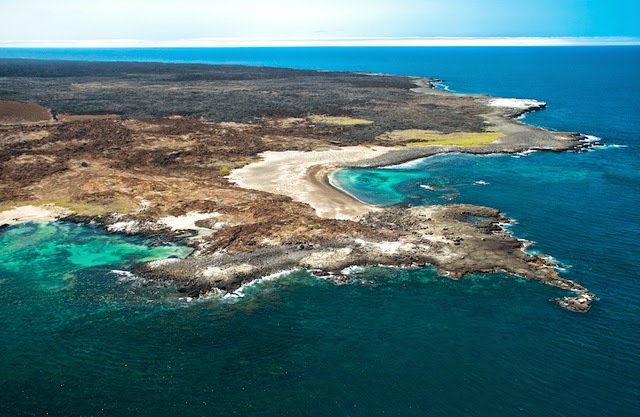 And that adaptation is most apparent on Fernandina, the youngest island in the Galapagos archipelago. It should go without saying that naturalists are a curious bunch and if you’ve ever traveled with me you’ll know that I can watch an animal’s behavior for hours. So, just as I would have done, when Merlen noticed a snake purposefully making its way across a rocky ledge, he followed. What he observed was remarkable. 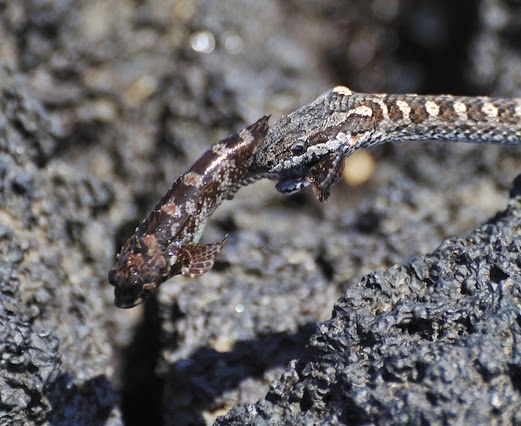 The snake stayed on the rocky protuberance on a lava ledge while craning its neck out over the ocean itself. 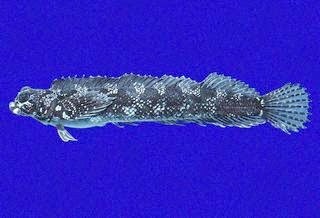 The snake struck quickly sideways and retreated having successfully “fished” for a four-eyed blenny fish. Having made this observation once, the naturalist continued to see many other snakes engage in this peculiar behavior. He reports that at Cape Hammond (another infrequently-visited spot on Fernandina) he’s observed as many as 15 snakes investigating the water’s edges for prey. The full extent of what scientists can learn from this newly-observed and clearly adaptive snake behavior is still being studied. An important question is raised though – can these endemic Galapagos terrestrial snakes on the western coast of Fernandina be engaging in adaptive behavior that will eventually lead to a new Galapagos fish-eating snake species? Only time will tell. For now, I’m going to continue watching for signs of this behavior on my journeys. And I’m looking forward to the BBC footage of the fish-eaters due to be released later in 2014. I’ll let you know when. Follow my blog for a follow-up story about the endemic snakes of the Galapagos Islands. Photos in this story are from the Galapagos Conservancy and Discoverlife.org.